As distributors of camera systems, we hear this question many times a day. Why does your GigEor USB3 cable cost so much? I can just buy a cable online from Amazon, Ebay, etc for $5 when yours cost $25 or more! The answer is: You can.. sometimes… but it depends upon many things, and how critical those things are to your application. From many years of diagnosing industrial imaging problems, after incorrect software setup, BAD CABLES ARE NEXT ON THE LIST FOR “MY CAMERA DOESN’T WORK” problems!! Distance, the killing factor! If you were to look at a ‘bode plot’ of the signal transmitting from the camera to the computer you would see dramatic attenuation of the signal vs. distance, and also versus the data rate. In fact, at the distance limits, you might wonder if it actually works as the signal is so low! GigE is rated at 100 meters, however, the signal does degrade quite a bit, so cable quality and data rate will be the determining factors. USB3 does not have a real specification and it is difficult to find consumer grade cables greater than 2 meters in length. In fact, we have experienced poor results with consumer cables greater than 1 meter in length! What are the differences between ‘Industrial’ and ‘’consumer’ cables? Industrial cables are tested to a specification for each cable. There are no batch to batch differences. Example 1: In a research lab, using a microscope 1 meter from the computer running low data rates, non automated. Distance is small, data rate is low, chance of someone pulling on the cable is low, and if the data doesn’t get delivered, you can re-acquire the image. There is no big need for a special cable and can buy it off the internet. Example 1a:Let’s change some of these parameters, now assuming you are not in lab, but the microscope is in an OEM instrument being shipped all over the world. If the system fails because you went with an unspecified cable, what is the cost of sending someone to fix this system 3000 miles away? In this situation, even though the distance is small, and the data rate is low, the consequences of a cable failure are very high! You can probably get by with ‘higher quality’ consumer cables. At distances greater than 20 meters, if you care about system reliability, you will definitely want industrial cables. Example 3. Two to Four GigE cameras running at close to full bandwidth in a system. Example 4. GigE cameras in an instrument. Regular GigE cables are just locked into the RJ45 with a plastic tab. If your product is being shipped, you can’t rely on this not to break. You want an industrial cable with screw locks. Example 5. GigE cameras in a lab. Save the money and use a consumer cable! If you running USB3 cables at distances more than 2 meters, DO NOT use consumer cables. If you are running multiple cameras at high speeds, DO NOT use consumer cables. Obviously, if you need to make sure your cables stay connected, and need lock downs on the connectors, you cannot use consumer cables. If you are running low speed , short distance, and you can afford to re-transmit your data, consumer cables might be just fine. 1st Vision is a distributor for Alysium-Tech who manufactures industrial GigE Vision and USB3 Vision cables along with other types of camera cables. Full data sheets are available which include test specifications in the links below. Contact us for a quote on your desired cable! We have cables in stock! Have more questions? Please do not hesitate to Contact us! 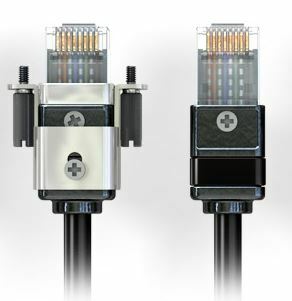 1st Vision can provide additional information on the industrial cables. Furthermore we can provide a complete solution including cameras, lenses, lighting and cables. We have over 100 years of combined experience we can put to work for you! USB3 works great at full bandwidth at 3 meters, and usually even at 5 meters, although we have found instances where certain combinations of motherboards, cameras, and cables have not been 100%. Fortunately, we have the solution. 1st Vision offers both active electrical cables, and introducing Hybrid Active Optical cables. Hybrid Active Optical Cables (AOC) transmit USB3.0 data and power with no repeaters up to 50 meters and customized up to 500 meters. In addition to the benefits of fiber for transmission, copper has been implemented for power. The cables meet the USB3.0 specifications and provide power via the USB port. These are very cost effective starting at 10 meters. This combination of USB3.0 cameras with Hybrid AOC's now provides high speed and long cable lengths! This is perfect for updating some camera link installations providing higher speeds but not limited to 10 meter cable lengths. Additionally, When used in conjunction with a USB hub, several cameras can be deployed at extended distances. 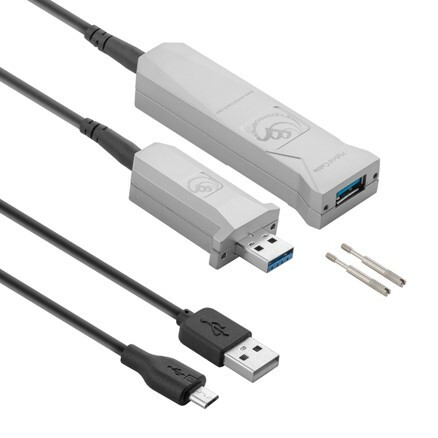 Example: (4) cameras deployed via USB3.0 Hub and connected via a standard USB3.0 cable to the PC. In cases that you need to extend past 5 meters with USB3.0, BUT not plagued with excessive lengths or non flexing application, we have Active USB3 cables in 5, 10, 15 and 20 meter lengths. 1st Vision has extensive knowledge in industrial imaging and can help answer any questions. We have over 100 years of combined knowledge and look forward to discussing your application. Please do not hesitate to Contact us! 1st Vision can provide a complete solution including cameras, lenses, lighting and cables.